This is one of the nation's most beautiful fountains. An aesthetic delight of visiting Detroit is to view this magnificent fountain spraying water on a breezy day. The circumference is 510 feet, and a series of impressive white marble bowls are topped with a receptacle from which water is projected 40 feet into the air. The mouths of turtles, lions, Neptune figures and artistic horns project smaller jets from the base of this fountain, and at night, colored lights illuminate the water flows. The border of the impressive reflecting pool is decorated with Pewabic Pottery tile. James Scott was a Detroit real estate speculator and developer who lived from 1831 to 1910. He became rich, but had very few friends or colleagues. Dennis Nawaroski in his book about public art in Detroit described Scott as "shady, eccentric and very controversial." Hawkins Ferry, the most authoritative scholar to write about Detroit's architecture described Scott as a "vindictive, scurrilous, misanthrope." Apparently Scott tried to intimidate his competitors and, if that did not succeed, he sued them. 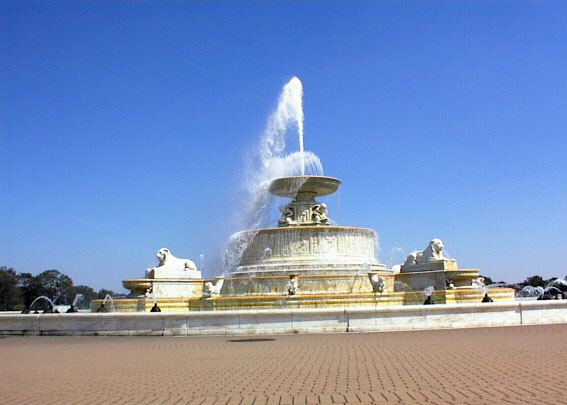 Scott's Last Will and Testament devoted his fortune to the erection of a fountain on Belle Isle, but demanded that a life-size statue of himself be included. Some thought that his will was a mean-spirited practical joke, and many objected to building a monument to such a rogue. After years of controversy, the executors of his will appointed four of the nation's leading architects, including the son of Frederick Law Olmstead, to supervise a competition to select a designer for the fountain. The well-known New York architect, Cass Gilbert, won that competition in 1914. The next year, he won the competition to design what became one of the nation's most beautiful libraries—the building on Woodward. Cass Gilbert selected the New York sculptor Herbert Adams to design a life-sized statue of James Scott. Controversy continued about the Scott Fountain. Some of the city's leaders in the 1890s sought to celebrate the 200th anniversary of Cadillac's arrival with a magnificent monument. One of the nation's leading architect's, Sanford White, was selected and he designed a Doric column 24 feet in diameter and 220 feet high to be constructed on Belle Isle with a 1,500 foot promenade—a Detroit incarnation of the Washington Monument. The city's leaders could not raise sufficient funds for such a Detroit monument. However, many thought it was inappropriate to devote that same space on beautiful Belle Isle to a memorial for James Scott. Scott's estate kept appreciating as controversy raged. 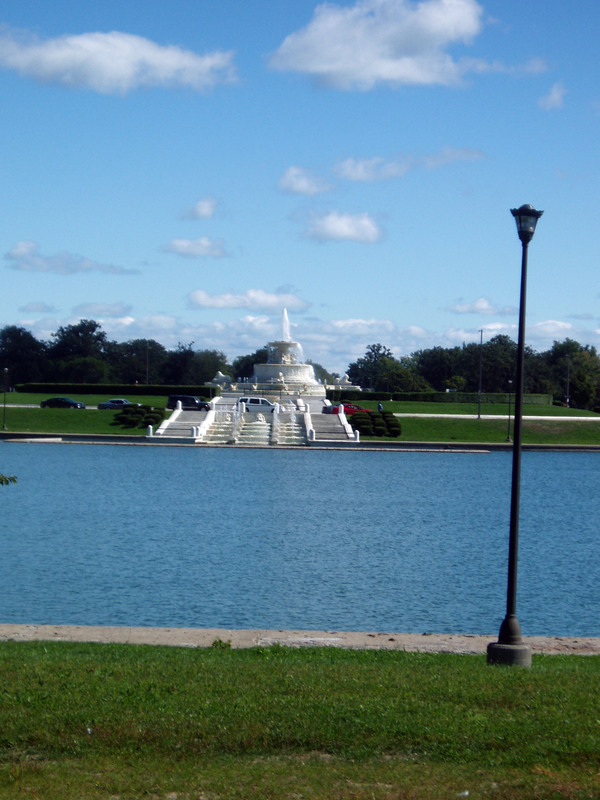 By the time building started, more than one million dollars were available to add almost 1,000 yards to the west end of Belle Isle to accommodate the Scott Fountain. The statue of a contemplative, impeccably attired James Scott pensively watching the soothing waters includes a welcoming lap that children and adults climb into to share Scott's perspective. This beautiful fountain was turned off in 2011. I have heard rumors that some of the copper pipes had been stolen by scrappers and the city had no funds to replace them. Because of the city's insolvency, Kevyn Orr was appointed Emergency Manager in March, 2013. In the summer of that year, using the extraordary powers granted to him by state law, he leased the city owned Belle Isle to the state of Michigan for thirty years. The state agreed to make substantial capital improvements in the park and provide police protection but may charge admission starting in 2015. Ron Olson, chief of Michigan's Department of Parks and Recreation, announced that the state had repaired the magnificent Scott Fountion and that it would resume operation on weeks in the spring of 2014.